Tail gunner with Frank Rimerman crew. Shot down over Rumania on a bombing mission over the Ploesti oil field. Bailed out and landed with Germans waiting with rifles aimed at him. Taken to a POW camp for the rest of the war. He passed away in 1990 and is buried in the National Cemetary in Bourne Massachusetts. I am his son Arthur Pyne Jr. He was a great hero to me. "On this mission we were flying #44, an older B-24 with a tail turret installed in the nose. We were in the left wing of the second element C flight. Our diamond was destroyed. All 4 planes were shot down. "On this mission, neither our navigator nor ball turret gunner flew with us. Our navigator had come down with pneumonia and was in the hospital. Our ball-turret gunner had dysentery and wasn't able to fly. We were assigned a ball-turret gunner from a crew that wasn’t scheduled to fly that day. His name was S/Sgt Arthur R. Pyne. He was from Mass. "The two crew members, who didn't fly with us the day we went down, were killed later in the war. Our navigator's plane went down in the Adriatic returning from a mission 9/10/44. Our tail gunner was killed 8/15/44, when the plane blew-up on take-off." 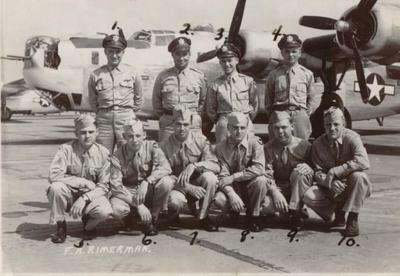 The Frank Rimerman crew was on the plane that "blew-up on take-off" five days after the Thomas Badger crew was shot down. Everyone who flew with Tom that day was saved. They all became prisoners of war, but everyone survived. Arthur, I neglected to add my email address: cbaldon@comcast.net. Please contact me. I have more info about Franklin Rimmerman's crew that your father was originally in. Thank You! Thank you for your post honoring your father. My father also flew over the Ploesti oil fields. I have the utmost respect for the service of the 376th personnel.